We are Manufacturers' Representatives & Distributors! 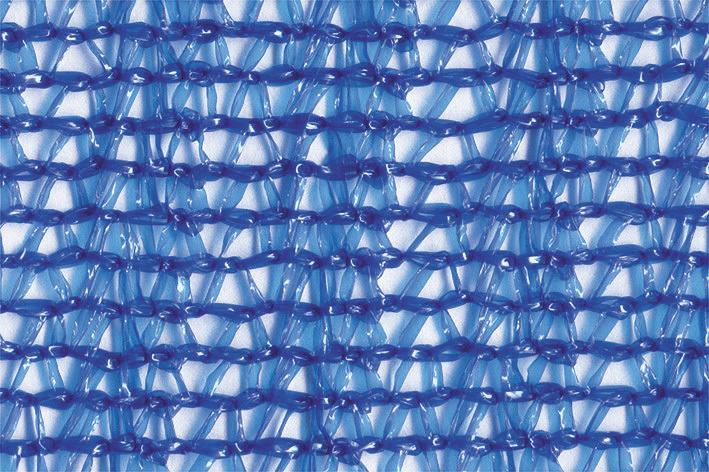 Aluminet® is a high quality metallized knitted screen. 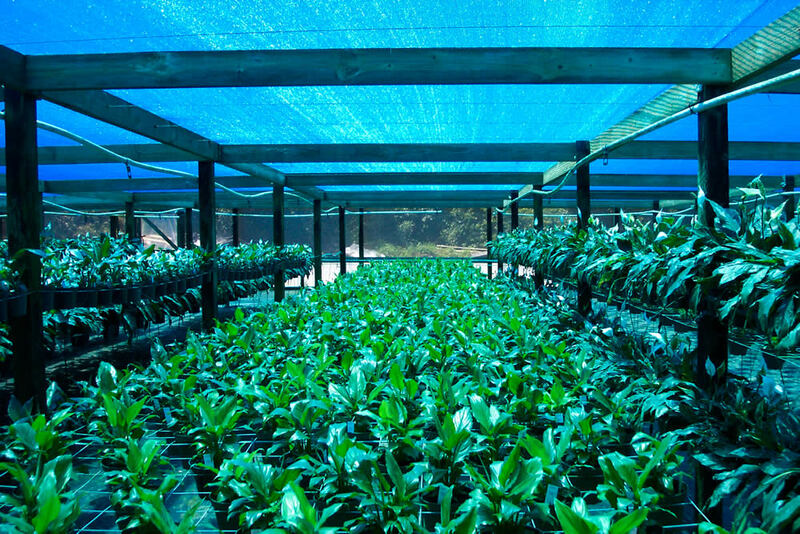 Aluminet greatly moderates day/night temperatures, enabling microclimate control in greenhouses, nurseries and fog houses. It provides uniform shadow, controls air movement, protects against frost radiation, saves energy in heated structures and transmits optimum diffused light to the crops. •Aluminet can decrease greenhouse summertime water consumption 33% by decreasing the daytime temperature inside the greenhouse 20%. In a well-ventilated structure, the temperature inside the house equals the outside ambient temperature which is normally less than 100 degrees Fahrenheit even in South Florida. •Aluminet can decrease wintertime heating costs. It creates a thermo-reflective barrier similar to a mountain climber’s blanket by holding ground level heat inside. During an overnight freeze, Aluminet can maintain the inside temperature above freezing even when the outside temperature dips to 24 degrees Fahrenheit. It does all of this while transmitting optimum dispersed light to the crops. Harness the power of sunlight! Think of ChromatiNet® as a slice of the rainbow. 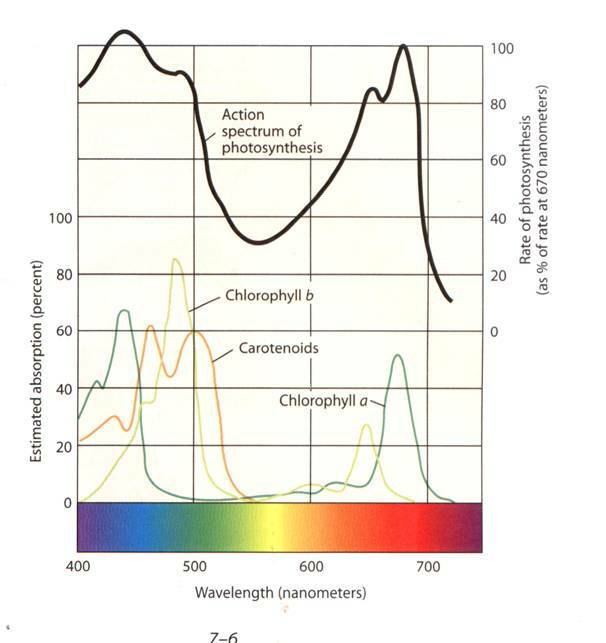 Innovative ChromatiNet® transforms light into profits by managing red, blue, and silver light spectrums for the benefit of your plants. These new-generation nets help growers control vegetative growth characteristics such as leaf size, branch length and plant height in ornamental plants, as well as control the rate of maturation and flowering. 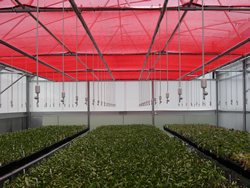 ChromatiNet Blue shade cloth reduces the spectrum of red and far-red light and increases the blue light spectrum, creating a compact plant with deeper green foliage. The grower can grow and ship more quality plants per square foot using only sunlight. In some varieties it can postpone flowering. 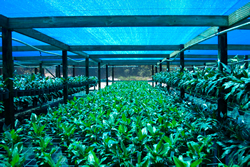 Blue ChromatiNet® allows you to grow healthy plants that meet market requirements. Annuals in nurseries are grown under the same percentage of shade; the plant crowns develop naturally with minimal pruning and no chemicals. For blooming, the plants are placed in full sun. The increase in Blue light changes the rhythm of the plant. Blue light acts as a natural growth regulator decreasing foliage volume by around 20%, darkening the foliage and delaying the bloom. 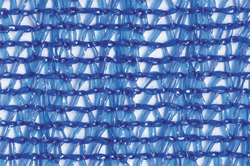 ChromatiNet Silver shade net causes light distribution by refraction of direct light radiation through the special crystalloid structure of the silver net filament. The thermo-reflective barrier creates a cooler microclimate and blocks IR radiation. The plants exhibit increased shoots and buds, as well as enhanced variegation. 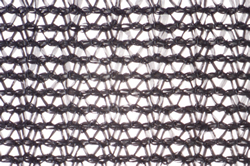 Silver ChromatiNet® creates an environment that is 10% cooler than black net. The Silver net blocks IR radiation or heat from the ground, 5% greater than under Black net, protecting crops in overnight frost (29°F). 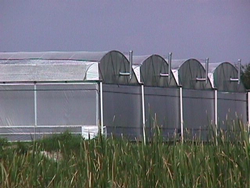 Plants under this net exhibit more shoots and less stretch. The light under Silver net is excellent for propagation or for climate control in shade houses. Sunlight is diffused through the Silver net; it mimics the light reaching the plant under a tree canopy. 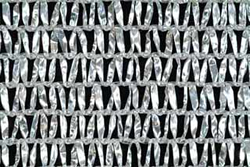 Light distribution is caused by refraction of direct light radiation through the special crystalloid structure of the Silver net filament. Same variety, age, soil, fertilizer and cutting source. ChromatiNet Red shade cloth reduces the spectrum of blue, green and yellow light and increases the red and far-red light spectrum. The plants leaf surface is larger, their stems are longer and thicker, and the total foliage volume is higher. Root system development is enhanced in shoots and tissue culture. 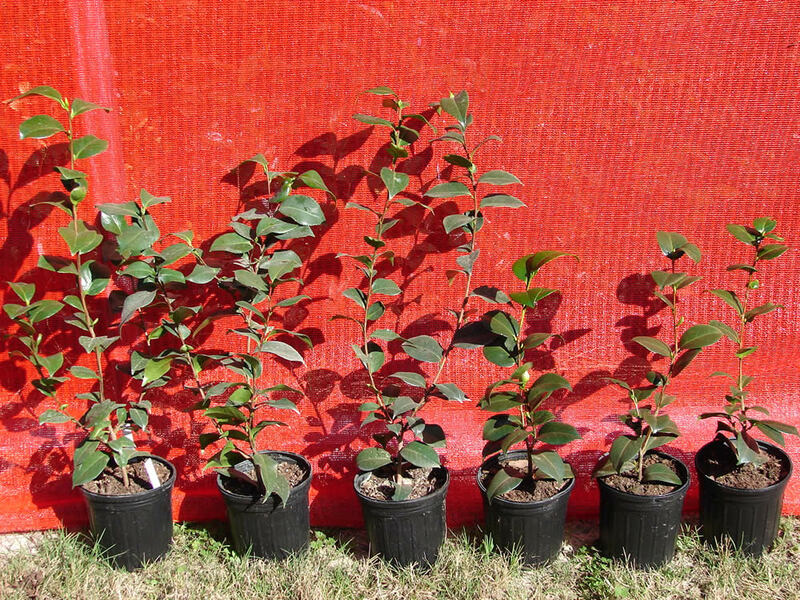 Plants grown under Red ChromatiNet® achieve early flowering without decreasing flower quality. The net is suitable mainly for growers who wish to accelerate growth and increase foliage volume, especially when the objective is to enhance development of root systems in shoots and tissue culture seedlings. 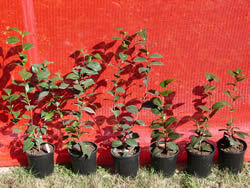 Lower shade percentages can be very effective at decreasing growing time on full sun plants. Sunlight is filtered through the Red ChromatiNet®,reducing the spectrum of blue, green and yellow light and increasing the red and far-red light spectrum. 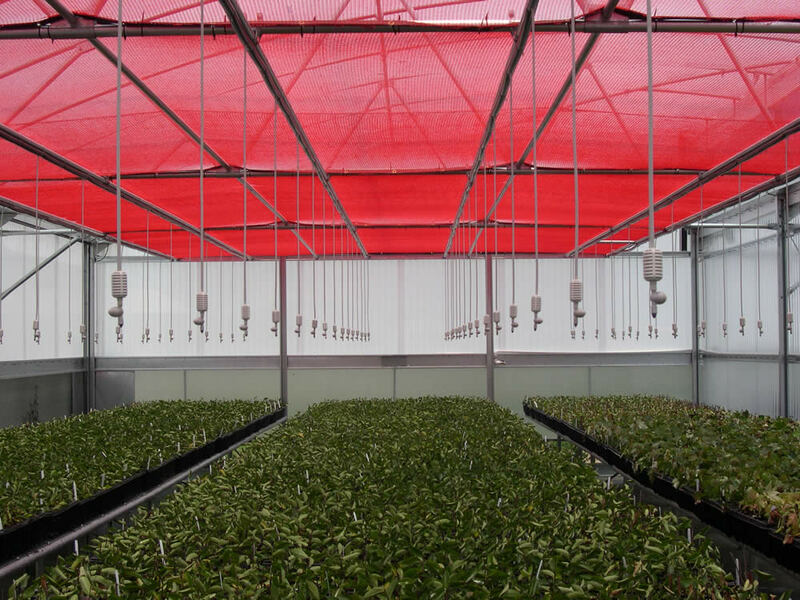 This increases the rhythm of plant development under red light, with a larger leaf surface, longer and thicker stems, and higher total foliage volume. 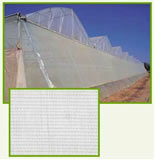 OptiNet 50 is a patented technology that integrates two methods for control of greenhouse thrips and other insects. The dual protection significantly reduces the number of pests entering the structure, while maintaining adequate airflow. As a result, fewer pesticide treatments are needed, complying with European standards, and saving costs. Optic protection: Insects are repelled by the screen's optical additives. 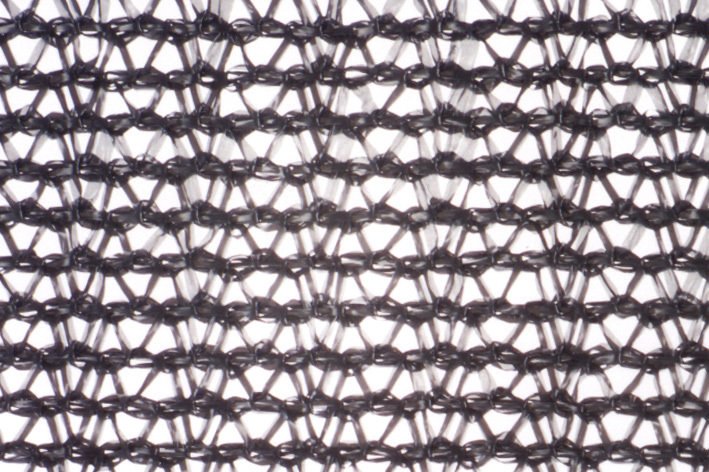 Physical protection: The fine 50 mesh screen provides a second line of protection. Black knitted provides light shade for vegetables, nurseries, cut flowers and fruit trees. 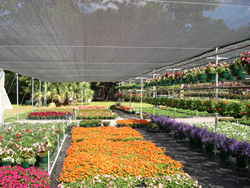 Additional shade for ornamental plants in the summer. Suitable to spread above greenhouse tops. Knitted in widths up to 10 m. Other widths are obtainable upon request. Flexible, light, strong and easy to spread. Packing, shipping and storage containers, Agricultural and Industrial bins. Reduces the long-term cost of handling fruit and veggies. Please contact us for samples and pricing!